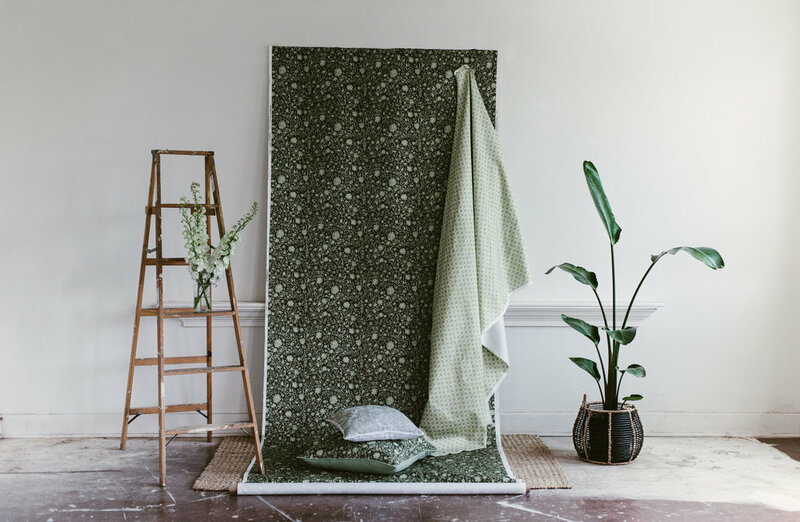 Originally from South Carolina, Kathryn Maresca graduated from the textiles department of The Rhode Island School of Design. Making things by hand became such a major part of her design process, and it continues to be the backbone of her work today. After graduating she spent several years living and working in New York in the fashion industry before moving back to the south where she set up her textile studio. 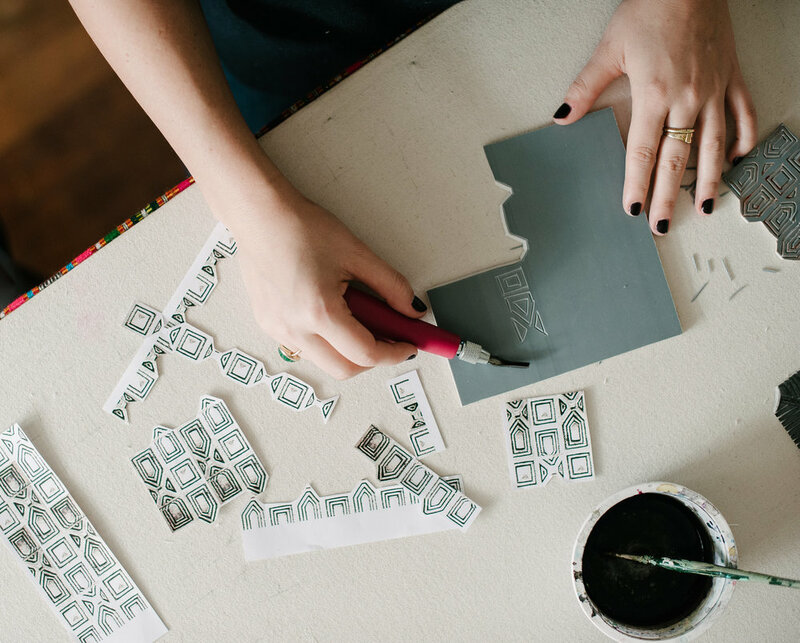 Today Kathryn places her own modern twist on classic structures to create fresh, hand printed fabrics. What made you decide to focus your skills in textiles? I went to RISD thinking I’d major in apparel design, but quickly realized that the thing I’d always loved about clothing was the fabrics they were made of rather than their silhouettes. Luckily, RISD has an amazing textile department so I was able to major in and learn about the thing I was really passionate about—designing and creating fabrics. I always start a design by hand, whether it’s through drawing or carving a stamp or water coloring. I gather lots of reference materials and start making marks that reinterpret whatever I’m looking at. My favorite references these days are architectural, although inspiration can come from anywhere. I have two designs in the collection that were inspired by antique drain grates I saw on the street when I was walking to the museum when I first moved to Savannah. Once I have the patterns worked out I usually make a silkscreen of the design so I can test it and perfect it in my own studio before sending the design off to a mill for yardage production. Savannah! What a city to call home! How does it inspire your work? It’s so beautiful and historic here and I think that literally inspires me (like I mentioned before with the antique grates on the sidewalk). But Savannah also inspires me to sit back, calm down and take time to design. I lived in Brooklyn before moving back south and I think the urgency of daily living took a toll on my creative abilities there. Here in Savannah things just move more slowly, and that’s really helpful for my creative process. How does it feel to see your work “displayed” in someone’s home? 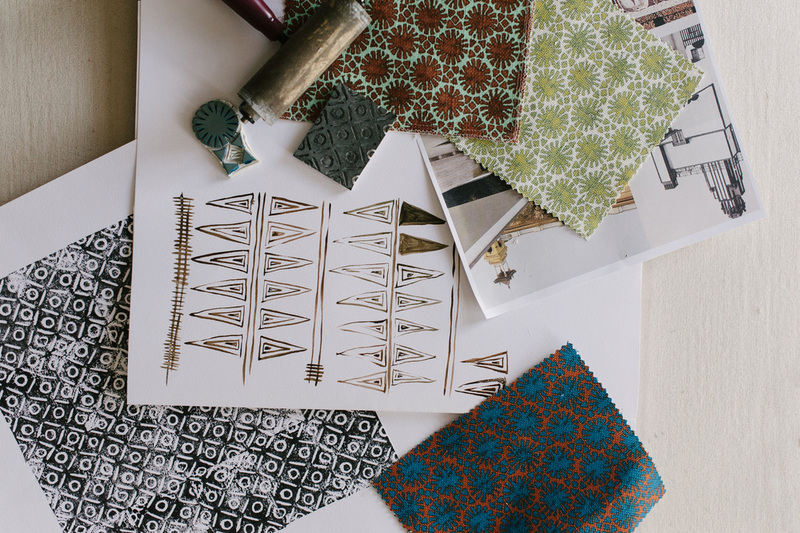 When a client orders my fabric to use in their home, they’ve decided that it’s one of the things they want to see every day—and that’s a great feeling! Does the utilitarian aspect of your finished product affect your planning/design process? It’s always something I think about, how the fabric will be used in the end. Of course we all want to make a beautiful textile, but if it’s going on a sofa that’s being sat on every day it also has to be durable and stay looking beautiful for a long time. So I source the best fabrics to print on, use trusted print manufacturers, and make sure every fabric is tested before being put on the market to make sure it will last. I think creativity is taking an idea and constantly pushing it into a place that feels new and exciting for you. It’s a progression from one idea to the next and onto the next. And that push from one idea to the next is so hard sometimes, but once you get to that next step it’s also so rewarding. Where can we expect to see you in the future? To answer the question in a literal way, my line is launching in New York at the Bradley showroom in the Lexington Design Center in September. And that’s very exciting—I’ve held out on New York for a long time to find the right place for my work, so this has been a long time coming and will be a great step forward for Maresca Textiles. But on a more abstract level—in the future you will see me continue to push my work to new places, always interpreting what pattern means to me.